Zion Market Research has published a new report titled “Concrete Pump Market by Type (Truck-Mounted Concrete Pumps, Stationary Concrete Pumps, and Specialized Concrete Pumps) and by End-User (Industrial, Commercial, and Domestic): Global Industry Perspective, Comprehensive Analysis, and Forecast, 2018–2025”. According to the report, the global concrete pump market was valued at USD 3.92 billion in 2018 and is expected to reach USD 5.9 billion by 2025, at a CAGR of 6% between 2019 and 2025. A concrete pump is a heavy machine that is used to transfer liquid concrete by pumping. Concrete pumping is one of the most widely used approaches to place concrete. Generally, there are three types of concrete pumps—truck-mounted, specialized, and stationary. These concrete pumps are extensively used in the construction sectors across the globe. The global concrete pump market is projected to grow significantly in the next few years, owing to the increasing product application for several construction activities. The rising recovery in construction expenditure across residential and non-residential sectors is likely to further propel the global concrete pump market over the estimated timeframe. Moreover, the growing domestic construction in several developing countries, such as India, China, and Brazil, is also expected to boost the concrete pump market globally in the future. However, the high cost of concrete pumps may slowdown this market’s growth in the upcoming years. Alternatively, the growing trend of megastructures’ construction is further projected to offer new growth opportunities in the global concrete pump market in the future. The global concrete pump market is classified based on type and end-user. By type, the global concrete pump market includes truck-mounted concrete pumps, stationary concrete pumps, and specialized concrete pumps. Truck mounted concrete pumps are projected to grow substantially in the upcoming years. Truck mounted concrete pumps are concrete pump fitted to a truck and are also known as boom concrete pumps. The rising demand for skyscrapers and multistoried buildings in various countries is projected to drive the truck-mounted concrete pumps segment globally. By end-user, the global concrete pump market includes industrial, commercial, and domestic. The domestic sector is projected to grow rapidly in the next few years, owing to rapid urbanization and growing housing construction activities. The rising application of concrete pump in commercial construction is likely to fuel the global concrete pump market growth. In addition, the industrial segment is estimated to grow significantly in the upcoming years. By region, the Asia Pacific region contributed the largest share to the global concrete pump market in 2018 and is expected to dominate the global market in the future. This can be attributed to the growing construction activities and rising population. The North American and European regions are anticipated to grow significantly in the upcoming years in the global concrete pump market, owing to the increasing number of commercial construction activities in these regions. 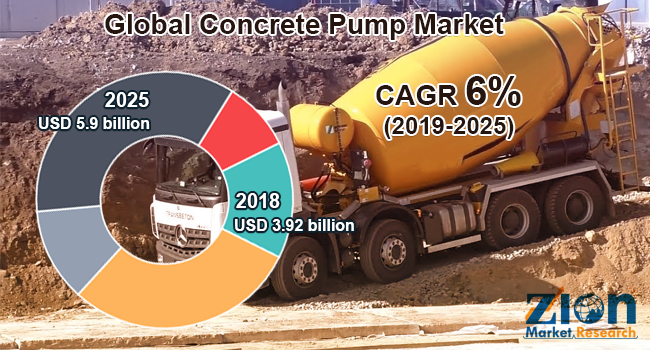 Some key players of the global concrete pump market are Concord Concrete Pumps, LIEBHERR Group, Ajax Fiori Engineering, Alliance Concrete Pumps Inc., Zoomlion Heavy Machinery Co, Ltd., SCHWING GmbH, Apollo Infratech Pvt. Ltd., PCP Group, Sany Group, and PUTZMEISTER, among others.